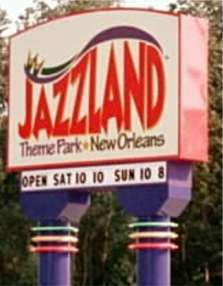 was Jazzland Theme Park, New Orleans (East) from 2000-2002. Location: New Orleans East at I-10 & I-510 Intersection. Allow 30 min.+ drive from downtown or Metairie, and longer from across the Mississippi River. CLOSED following Hurricane Katrina 8/29/2005, probably long-term. Not likely to reopen. Batman roller coaster was dismantled in 2006. 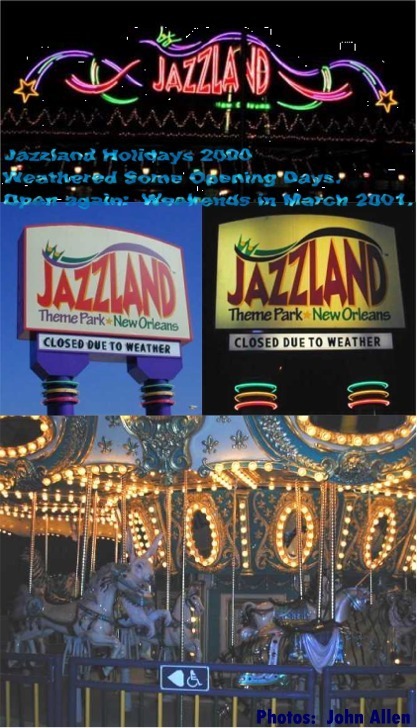 Some Photos of the 2000 & 2001 Seasons at Jazzland, featuring the MegaZeph. Jazzland 2000, First Season photos. Construction #2, & old Zephyr photo. 1999 Construction #3, & original Zephyr photo. 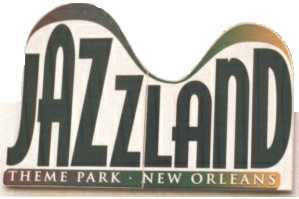 The MegaZeph was designed exclusively for Jazzland for its Grand Opening in 2000. This 4,000 foot long steel-structured, wood-track roller coaster was designed to provide the surprises of a twister-style layout in addition to the speed and "airtime" associated with an "out and back" style of coaster. The 110-foot lift hill provides a classic, straight forward first drop leading into a high-speed (up to 65 mile per hour) turnaround near Jazzland's lake's edge. Mega ZephsSM is the signature ride for Jazzland and is one of the premier wooden-track coasters in the country. The former Pontchartrain Beach Amusement Park, on the New Orleans Lakefront, with its long, infamous wooden Zephyr coaster, provided a portion of the name and the incentive behind Jazzland Theme Park's wood-track MeghZeph coaster, designed as an entirely wooden coaster. Although the MegaZeph was ordered too late to debut on-time for Jazzland's Grand Opening in 2000 as an entirely wooden coaster, the MegaZeph opened on-time with the park, and certainly is an enjoyable ride experience with good air-time! Some work was also done to improve one section of MegaZeph track during the middle of its first season.